Condo 219, bungalow style, at ground level in a very quiet area of the Birds of Paradise. 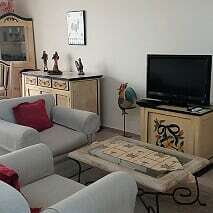 Nice one level apartment with a Mexican touch, 2 bedrooms, 2 full bathrooms, kitchen equipped with cooking implements. Washer and dryer, porch at the entrance and back patio with a grill. Parking space for one car. Includes all the utilities and cleaning once a week. Birds of Paradise is an expat Canadian and American community with 24 hours security guards, heated swimming pool, hot-tub, club house, fitness room and volunteer refreshment facility. Complex is run by an efficient manager and friendly staff. Great to come to relax, make friends, socialize, in a beautiful weather and local ambience, with all kinds of restaurants and stores in the surroundings.